Madam Chiam Curry Noodle House or what we often call Mei Yee Pan Mee is my frequent lunch spot at Cheras Area. 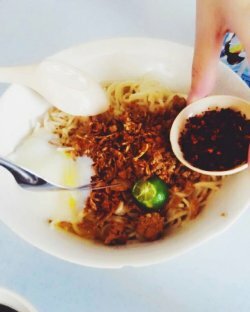 The curry noodle house has opened for more than 10 years since 2004 and has stolen away the heart of many Pan Mee lovers. They have moved from the old shop houses to a new shop just right besides the old shop, which is more spacious. Do expect huge crowd of customers during lunch hour and sometimes you might need to mix table with other customers! Alright, let’s back to the food! Even though the shop is named after curry noodle but the signature dish would be their dry chili pan mee. 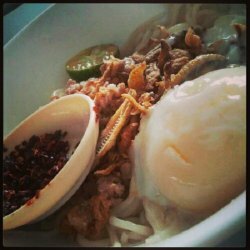 Springy noodles come with fried shallots, minced pork, lime, ikan bilis and onsen egg. 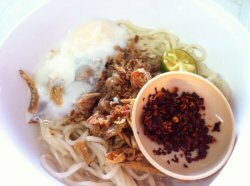 The highlight of the dish is their homemade chili pastes, which is a MUST for the dry noodle. You will get served with one small plate of chili pastes and just add according to the spiciness you want. Squeeze the lime juice into your noodles, add in enough amount of chili pastes, lastly, mix everything together and now you’ll be able to enjoy your noodle. 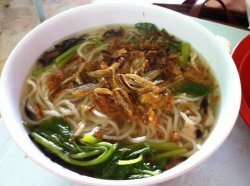 Don’t have to worry about the alkaline taste of noodle as they make their own noodles, so you can hardly find the same taste from other places. The noodle has really good texture, springy and chewy, with a hint of sourness and subtly spiciness; everything is a win element for a bowl of good chili pan mee. 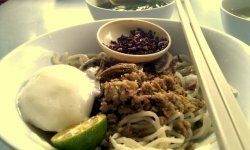 Other than dry chili pan mee, you can give a try to their dry yee mee as well. Comes with the same toppings of chili pan mee, they replace the pan mee with yee mee, which give your taste bud different kind of satisfaction! The dry curry chicken pan mee is also another of their selling point! Every dish comes with a complementary soup cooked with baby spinach leaves. Some tips for people who don’t eat ikan bilis, you can request them to leave out ikan bilis on your dish, and they will add on two fish balls or meat balls in your soup! What’cha waiting for? Grab your bowl of dry pee mee right now! Strolling around to find some good food and no direction to head, So, my friend giving suggesttion of going to this Madam Chiam Curry Noodle House. I was thinking huh? 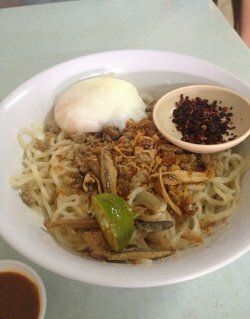 curry noodle, i don't feel like eating it and he said that the main dish is not the curry noodle, its the Dry Chilli Pan Mee instead.Their chilli pan mee is indeed awesome.Its topped with meat, poached egg, dried chilli flakes, deep fried anchovies and a squeeze of the calamansi juice. How special with a twist of taste! Strolling around to find some good food and no direction to head, So, my friend giving suggesttion of going to this Madam Chiam Curry Noodle House. I was thinking huh? 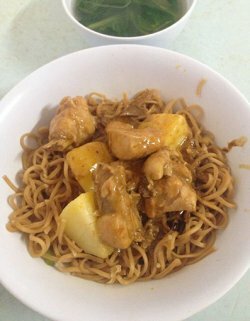 curry noodle, i don't feel like eating it and he said that the main dish is not the curry noodle, its the Dry Chilli Pan Mee instead. Their chilli pan mee is indeed awesome.Its topped with meat, poached egg, dried chilli flakes, deep fried anchovies and a squeeze of the calamansi juice. How special with a twist of taste! This time i also try another type of Pan mee. This soup Pan mee for me the Soup is very taste good, and the pan mee also small and make easy for my kid to eat. Beside that, I have to order big bowl because really not enough for my wife and my son. 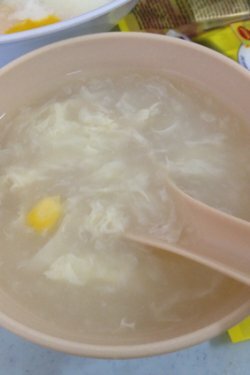 We also also famous desert as well, fu Juk Yee Mai ( Barley and fu juk ). really healthy food. This my favourite place to eat chilli pan mee in the saturday morning. The traditional make of the pan mee, the chilli really taste good. have a mixed pork meat, ikan bilis and also can add on half boil egg make the my breakfast fully healthy. The portion just enough for 1 person. also u can order the desert as well. I brought a friend from Penang to have breakfast here before and a week after he went back to Penang, he told me that he's still thinking about the Chilli Pan Mee he had here! 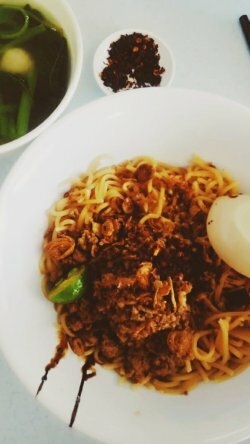 This place has been reviewed by many and it is so famous that if you come here on a weekend for lunch, you will have to wait awhile to even get a table because they have SO MANY patrons to attend to..
As for the noodles, it is undoubtedly the best Pan Mee in all of Kuala Lumpur! The egg is 3/4 boiled and when you mix it together with the noodles, it clings on to the noodles and makes it slick and slippery and very very delicious! Throw in the chilli flakes provided and you will get a very appetizing meal. However, if you are not a big fan of chilli, you can also opt to leave it out or even put just a little bit of the flakes... the choice is yours! Also, I happened to order their "Sui Kow" the other day after waiting very long (I was very hungry.. hehe) and it is just as delicious as their pan mee! Although you cannot see an entire prawn in there, the ingredients are all blended together into a very flavorful combination that you will want to order more if your tummy still has space! !